2016 marked the 350th anniversary of the death of the Frisian poet Gysbert Japicx (1603 – 1666). 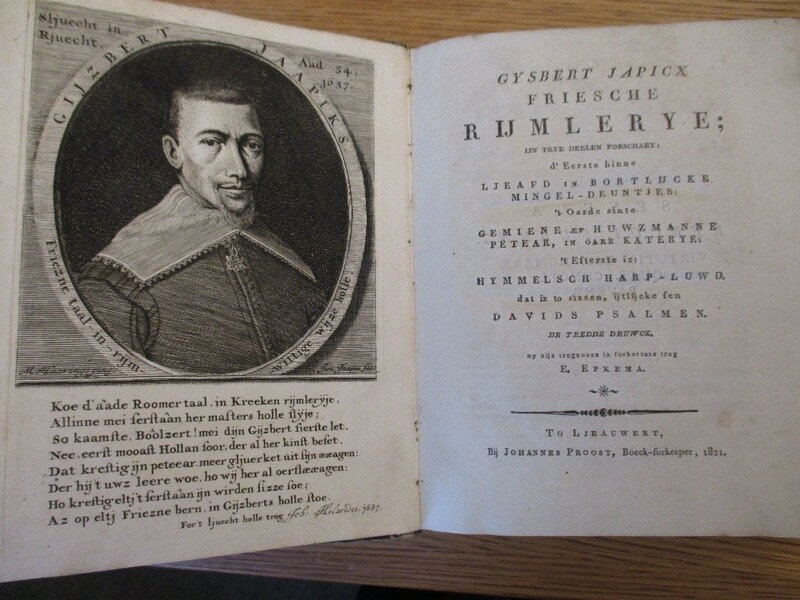 Seventeenth-century Frisia’s principal poet, Gysbert Japicx was crucial in preserving Frisian as a written language and in developing a Frisian spelling standard. His language is usually referred to as Middle Frisian (17th-18th century) although one could also call it Early Modern Frisian. The earliest and most important items for the study of Gysbert Japicx’s oeuvre are held in the Junius Collection in the Bodleian Library. This unique collection includes the only known manuscript of his work, the poem Wobbelke and two extremely rare and fragile copies of ‘De Friessche Tjerne, ofte bortlijcke rijmlerye’: all three items are in Japicx’s own hand and were published anonymously in 1640. Gysbert Japicx was a school teacher and a poet in Boalsert, Fryslân (a province in the north of the Netherlands). His first publication was the Friessche Tjerne, a rhyming text written for the entertainment of guests at a wedding. This type of publication was probably not meant to last, which may explain the poor quality of the paper and the fragile state of extant copies. His main work Friesche Rymlerye, published posthumously in 1668, contains mainly poetry and rhyming prose and also a few psalms. The oldest printed copy in Oxford is the 1821 edition held by the Taylorian. 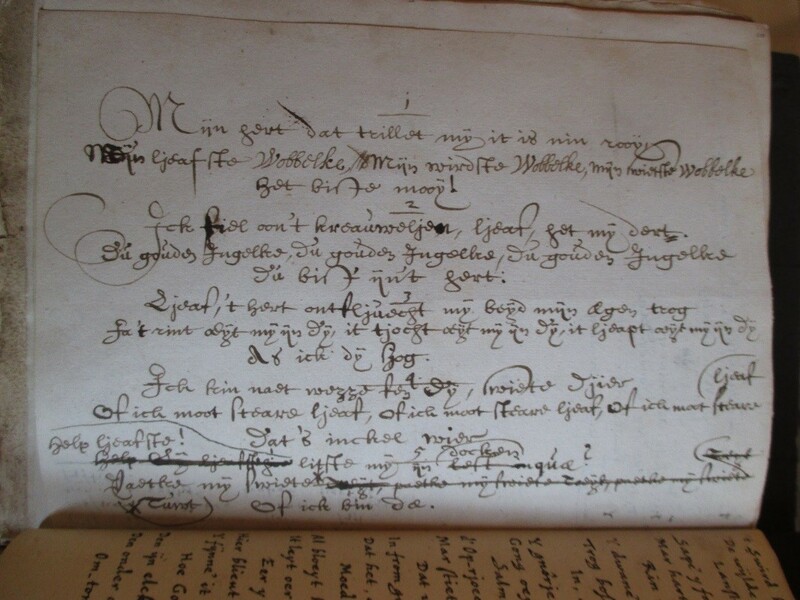 Among Japicx’s earliest manuscripts held by the Bodleian is an early version of the touching lovesong Wobbelke, in Japicx’s own hand, presumably written for the love of his life whom he later married. This is the only poem in Gysbert Japicx’s own hand; all the other poems are copied from originals by Franciscus Junius. Close-up images of these manuscripts can be seen in one of Omrop Fryslân’s (Frisian Television) documentaries on Gysbert Japicx. I had the honour to comment on camera. (The programme can be viewed at http://www.npo.nl/fryslan-dok/19-11-2016/POW_02993273.) The manuscripts are shown approximately five minutes into the programme. The manuscript poems in the Bodleian Library were edited and provided with an English commentary by Alistair Campbell, (Rawlinson and Bosworth Professor of Anglo-Saxon at Pembroke College,1963-1974) who bequeathed his Frisian collection to the Taylor Institution Library. 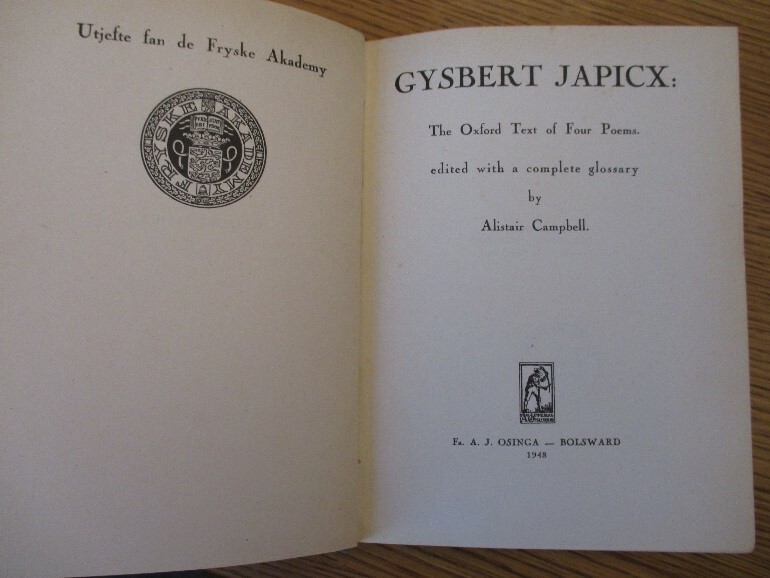 Gysbert Japicx has been hugely influential for the development of Frisian as a written language. He began writing in Frisian after a nearly one hundred year gap in which hardly any Frisian was written – the last charter in Old Frisian was written around 1550 – so head to invent a new spelling system as there was no previous one he could build on. The process of designing a new orthography was a gradual one. His earliest publication, De Friessche Tjerne, represents the first phase of development of a spelling standard of 17th century Frisian. 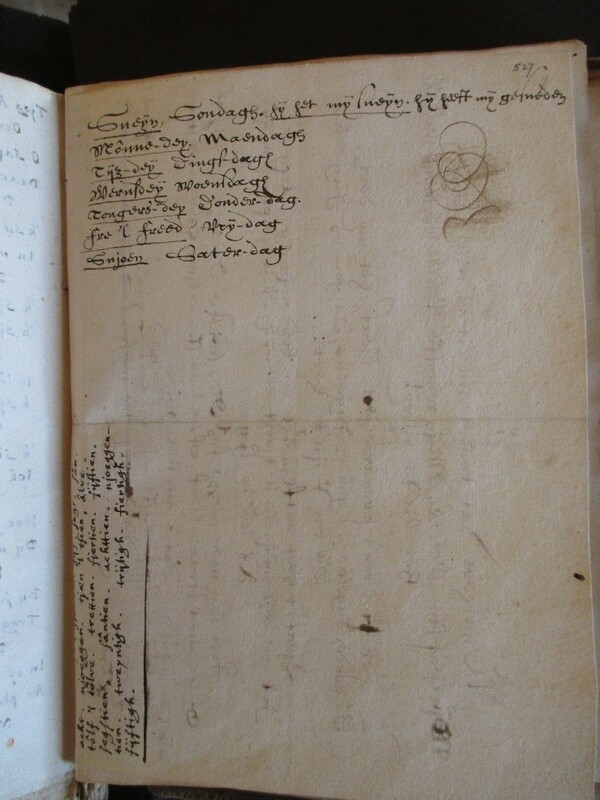 The next phase is found in Junius’ handwritten copies of Japicx’s work, which in turn differs from the spelling used in the final publication of poems Rymlerye in 1668. The orthography developed by Japicx has been of great importance to the Frisian writing tradition and it was followed until the early 19th century. It is generally assumed that Junius visited Japicx to learn Frisian. This assumption is supported by the Japicx manuscripts, where we find both Japicx’s and Junius’ handwriting together. The Japicx material consists of two manuscripts in the Junius collection, MS. Junius 115a and MS. Junius 122. MS. 115a is Junius’ glossary of Old Germanic. At the end of MS. 115a, after the glossary, some smaller pages are bound into the manuscript which contain poems by Gysbert Japicx in Junius’ hand. 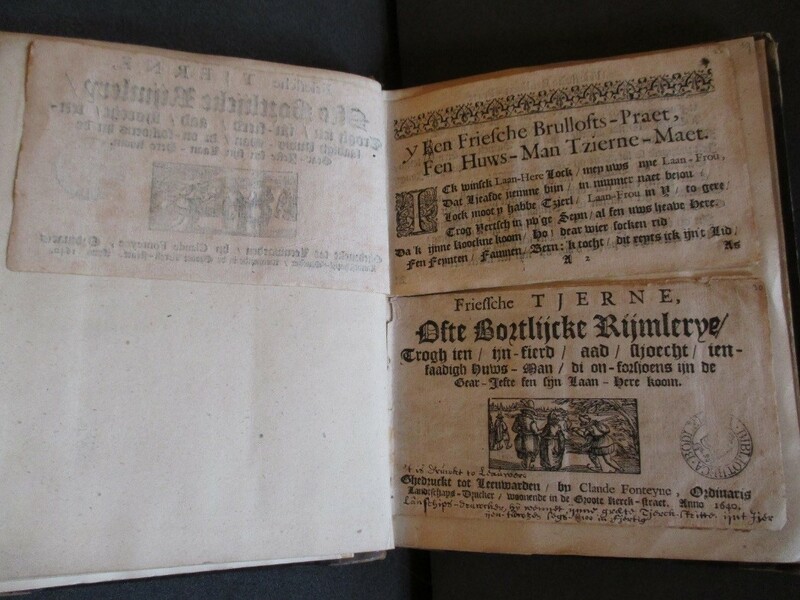 The big surprise is the inserted folio which has Japicx’s most well known poem Wobbelke. This piece of paper holds an early handwritten version of the poem with corrections by the author. On the front of this page (f.527r), both Japicx’s and Junius’ hands are found, an indication that Junius did indeed visit Japicx to learn Frisian. Japicx has written the days of the week in Frisian with Dutch translation, presumably for Junius’ benefit. Junius has written numerals in Frisian, perhaps dictated by Japicx, as might be expected of a Frisian language learner. His next task was copying Japicx’s poems. It is fortunate that he did so, since Junius’ copies are the only handwritten copies of those poems that survive. The other manuscript is MS. Junius 122, containing two rare copies of his De Friessche Tjerne, glued into the manuscript above each other. Both versions were printed in 1640. On the second of these the publication details (in Dutch!) are accompanied by a translation into Frisian in Gysbert Japicx’s hand. How did these manuscripts end up in the Junius collection in Oxford rather than in a Frisian Library? This has everything to do with Junius’ interest in Germanic languages. Born in Heidelberg, Junius was raised in the Netherlands and spent major parts of his adult life in England. He studied Frisian as a Germanic language before concentrating on Gothic and Old High German. He began his Germanic studies by learning Frisian during his stay in Fryslan between 1646 and1648, where he visited Gysbert Japicx. Looking for a Frisian tutor, there was not a lot of choice: in the mid 1640s Japicx appeared to be the only one who was able to write Frisian. Copying texts, such as Japicx’s poems, seemed to be Junius’ method of learning a language. He took his copies with him when he returned to England, and spent the last two years of his life in Oxford. 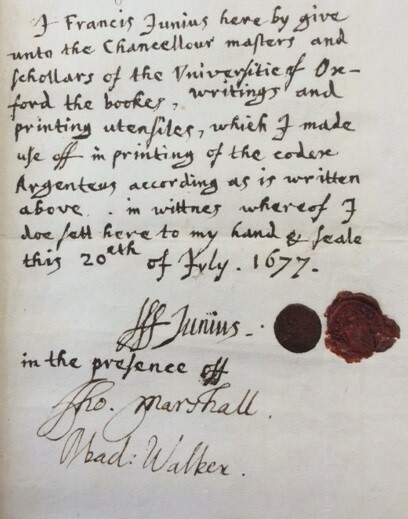 Junius knew Bodley’s Librarian, and before his death in November 1677 he gave his collection to the Bodleian Library. So the Junius collection is a donation rather than a bequest, as shown from the ‘deed of gift’ in the Bodleian archives. Junius’ deed of gift, witnessed by Tho(mas) Marshall and Obad(iah) Walker. Munske, Horst Haider and Nils Århammar (eds). 2001. Handbuch des Friesischen= Handbook of Frisian studies. Tübingen : Max Niemeyer Verlag. Bremmer, Rolf H. (ed). 1998. Franciscus Junius F.F. and his circle. Amsterdam : Rodopi. Sipma, P. 1932. Friessche tjerne, Gysbert Japicx ; mei ynleiding en oantekeningen fen P. Sipma. Boalsert : A.J. Osinga. Japicx, Gysbert. 1821. Friesche rijmlerye. 3. Druwck. op nijz trognoaze in forbettere trog E. Epkema. (3rd edition, checked again and corrected by E.Epkema). Ljeauwert : J. Proost. Japicx, Gysbert. Frieske rymlerije, yn trije delen forskaet : d’earste binne: Ljeafd en bortlike mingeldeutjes; ‘t oarde sinte: Gemiene ef Husmannepetaer en oare kalterije; ‘t efterste is Himelsk Harplud; dat is to sizzen utylike fen Davids Psalmen. Feitsma, Antonia.1956. Frysk ut de 17de ieu : teksten en fragminten. Estrikken 15. Grins : Frysk Ynstitút oan de R.U. to Grins. Japicx, Gysbert. 1948. The Oxford text of four poems. Edition with a complete glossary by Alistair Campbell. Bolsward : A.J. Osinga. This entry was posted in Special Collections and tagged Franciscus Junius, Frisian, Gysbert Japicx, manuscripts, translation on 20 March 2017 by ferrarij.